Wondering what to do during reading break? Come to the Library and catch some workshops to help you with your studies. 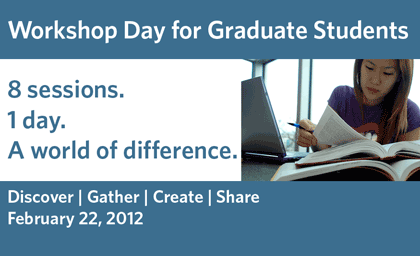 On February 22, UBC Library is hosting a workshop series for graduate students. Offering 8 sessions over the course of the day, plus lunch, the workshop series is open to graduate students from any discipline. These workshops provide targeted research help, and are facilitated by UBC Librarians. The workshops are limited to 25 people per session, so be sure to register soon! For more information or to register, visit the Library events calendar.